The "419" swindle - named after the penal code that outlaws it - will be targeted in particular. In the scam, people overseas are promised a share of non-existent riches in return for details of their bank account - which is then emptied. 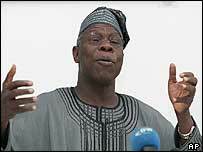 "The government will step up measures against these criminal activities," President Olusegun Obasanjo said. He said the inquiry will also consider establishing a new agency to deal with the crime. The 419 scam has been so successful in the past 20 years that according to Reuters news agency it is a significant foreign exchange earner in Nigeria. But BBC world affairs correspondent Mark Doyle says the government is keen to stamp out the fraud as it is giving Nigeria a bad name. The country's anti-fraud squad has arrested more than 200 people, including a federal lawmaker, since May for alleged involvement in computer fraud. The alleged perpetrators of the biggest ever 419 swindle, a $180m fraud that brought down a Brazilian bank, are among those facing prosecution. "I am convinced that your recommendations would assist government to design appropriate policies to block all the loopholes... and stamp out all forms of 419 from society," President Obasanjo said at the ceremony to launch the commission. The committee, which is headed by President Obasanjo's security adviser, has two months to submit a report.